Last month two of our brilliant team members visited Europe to undergo their intensive Kinnarps training. Alongside their training, Joel and Lisa took the opportunity to visit some of our European brands and their factories. Today we speak with Lisa Cunningham, our amazing VIC Sales Executive, about her experience and the surprising things she learnt while travelling abroad. Kinnarp, a small town in the south of Sweden has been the home of the Kinnarps HQ and production facility since its founding in 1942. Lisa and Joel began their trip in Kinnarp, Sweden. This small town in the south of Sweden has been the home of the Kinnarps HQ and production facility since its founding in 1942. What did you find most interesting about your experience the the Kinnarps headquarters? Meeting the other sales people that work for Kinnarps across the world was very interesting. Thankfully they all spoke English very well and we enjoyed learning about how they sell Kinnarps furniture to their customers. I found it very interesting to visit the Kinnarps Museum and see how the furniture had developed, and how Jarl had such innovative ideas which he saw through into a furniture solution. I loved the miniature version of furniture that was made and travelled in a suitcase so that Jarl could take them along when meeting prospective clients. It was also interesting to see how the furniture was developing at the same time that Steelcase by Frank Lloyd Wright was also developing in America. These were both similar concepts, but their physical distance would have made it unlikely that they would have been influenced by each other, as they wouldn’t have had the opportunity for viewing each others solutions. Today Kinnarps and Steelcase are two of the largest commercial office furniture companies in the world. Can you describe the atmosphere of the Kinnarps HQ? Very friendly, very productive and very colourful. I really loved the Canteen space where the factory workers and the management and admin staff all came together to have lunch etc. The canteen was also an extension of the showroom so it was a really lovely environment both comfortable and visually interesting. What product excited you most ? It was very hard to make that choice as there were so many beautiful and exciting products at each of the four manufacturers that we visited. If I had to narrow it down I would say it was the Martin Stoll collection - particularly the visitor seating which was handcrafted and beautifully detailed with combinations of timber, chrome, leather and mesh. The design was classic and the chairs were timeless and gorgeous. The team comprised of people from all across the world. Together they successfully completed 4 days of intensive training at the Kinnarps HQ in Kinnarps, Sweden. The miniature version of furniture that was made and travelled in a suitcase so that Kinnarp's founder Jarl could take them along when meeting prospective clients. 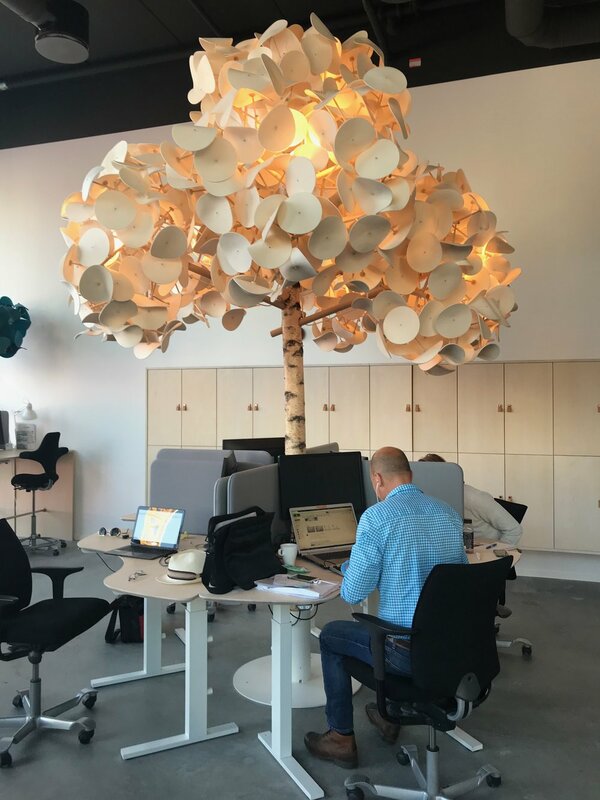 The Kinnarps HQ was "Very friendly, very productive and very colourful"
Green Furniture Concepts is one of our newer KFive brands - can you tell us about their HQ in Sweden? Johan and the team at Green Concept are so enthusiastic about their products and you can see why. 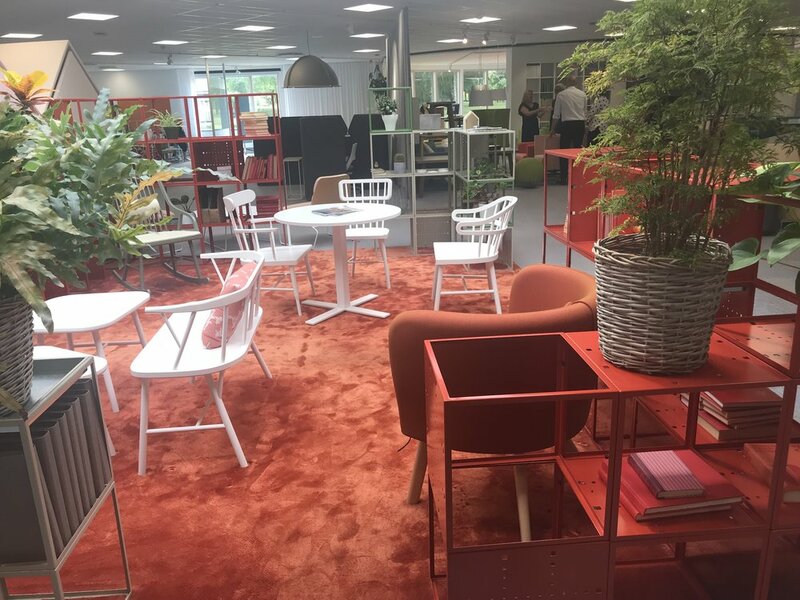 The showroom is a fantastic space to showcase their product and they have created so wonderful workspace environments incorporating the Green Concept Furniture products. Malmo is a very vibrant city and the showroom sits right in the area which is seeing a lot of commercial development so there is a real buzz. Johan is always working to improve product and create product solutions. The design changes to the acoustic leaves with the “clip-in and clip-out” detail is so much more time efficient and flexible. We also saw the model for the recliner version that has been sold to Rome airport - it will be installed later in the year. A new item introduced to solve a problem and has now become a feature is the introduction of the “Bird House” which is positioned in the acoustic trees. Initially the bird house was to conceal the power packs that are required for the lighting. 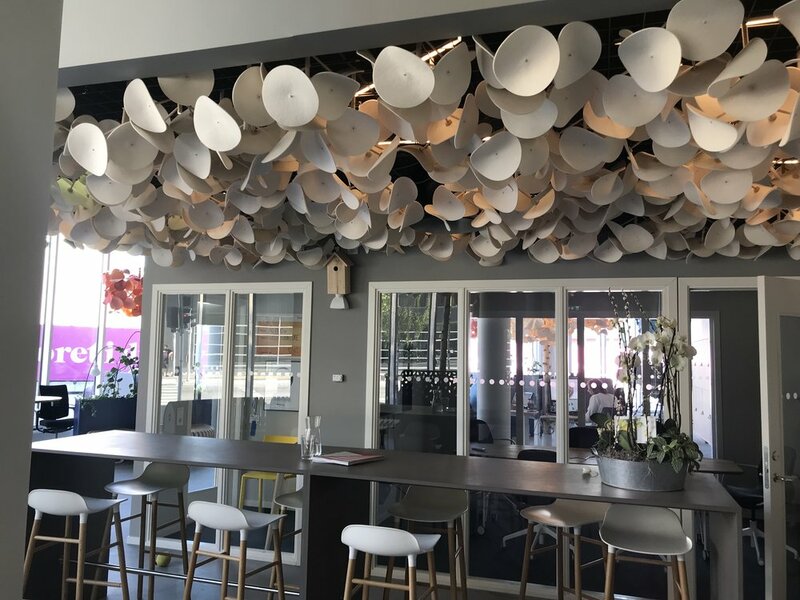 They have developed this further and now provide a black bird song audio loop which is also positioned in the birdhouse - it is really beautiful and creates a real sense of calmness which is ideal for airports and waiting areas where these products are most commonly installed. The other item which was clever was the installation of coloured lighting which can change with a control via an app on a smart phone. 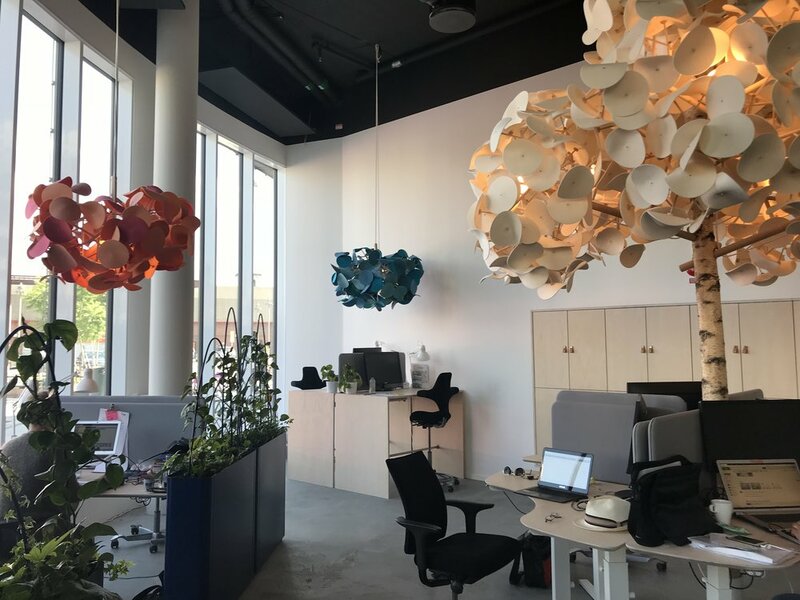 In the Green Concept Showroom they have a series of acoustic leaves with lighting installed on a wire grid as a ceiling feature over they collaborative space. This was very effective in changing the tempo or the mood of the space by changing the colours subtlety. Canteen area with a ceiling covered in the Leaf Lam. Coloured lighting which can change with a control via an app on a smart phone, and the bird house. You visited our friends at Montbel and Segis in Italy, can you tell us about something you learnt at each? At Montbel it was interesting to see how much work goes into creating every piece. From the initial timber drying process which takes days to the timber shaping, staining, sanding and then upholstery. The quality of each piece has been created by many hands that take part in the process and the result is of such a high standard. You can tell that this factory is not about “mass production” it is about craftsmanship. It was great to see the new product that they have introduced the “Star” which could be used in hotel foyers or public spaces for higher education. It was interesting to see how a slight change to an upholstery detail or a different leg frame can make a chair look entirely different which was evident with the Rose chair displayed in the showroom. Montbel was founded in 1959 by Mr.Silvano Montina and is based in Udine, Italy. At Segis it was interesting to see how they are now incorporating usb charging devices into some of the large public seating pieces such as Highway and Flores. I was incredibly impressed by the factory which was so clean, well organised and productive. It was great to see some of the new collections including Billa seating and Artful table. I was also reminded of how many of Segis products are suitable for outdoor and have been tried and tested over many years as we saw at the hotel where we stayed that Breeze was used around the pool area and the outdoor eating and looked fantastic even though it had been there for more than 12 years. We also saw another example at San Giamarno in the outdoor auditorium where there were a large number of Breeze chairs which had been there for more than 15 years. 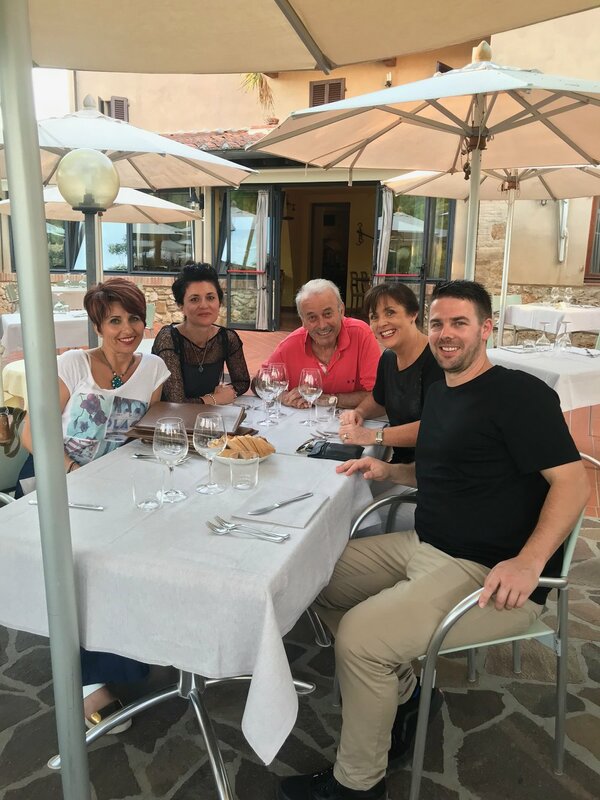 I loved the fact that Segis is a family owned and operated company we got to meet the very colourful Franco and his son Francesco, and heard all about the grandson who was just a toddler. 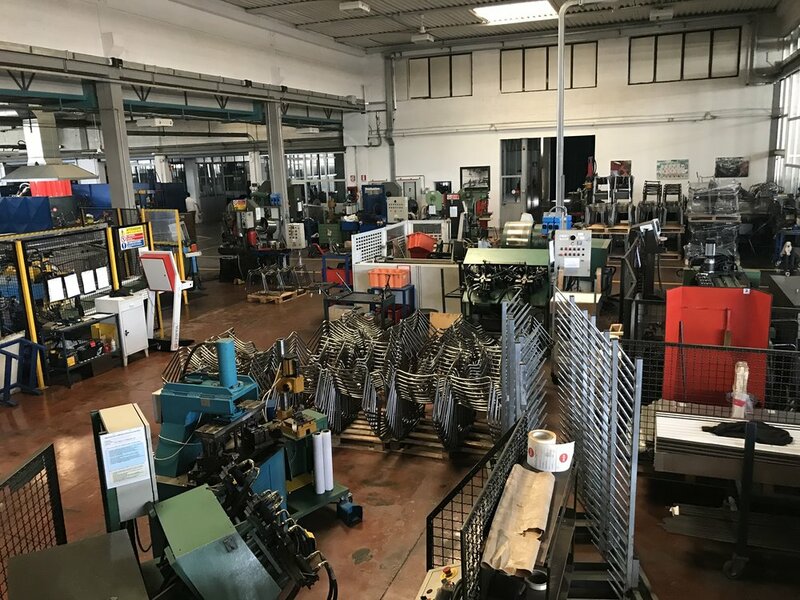 The Segis factory in Poggibonsi, Italy. "The factory was amazingly clean, not a chair frame or piece of material out of place"
Did you get to try any local delicacies which people may not know about? In Sweden I was told to try a prawn sandwich which I did enjoy. In Tuscany we were treated to a beautiful meal at a Michelin Restaurant and got to taste the local truffles which were shaved over a beautiful Beef Carpaccio dish. What was your biggest lesson from the trip? I wish I knew more of the Italian language. We got by of course but I loved listening to the people on the trains and on the street ands I wish I could have understood them better. In Tuscany we were treated to a beautiful meal at a Michelin Restaurant and got to taste the local truffles which were shaved over a beautiful Beef Carpaccio dish.